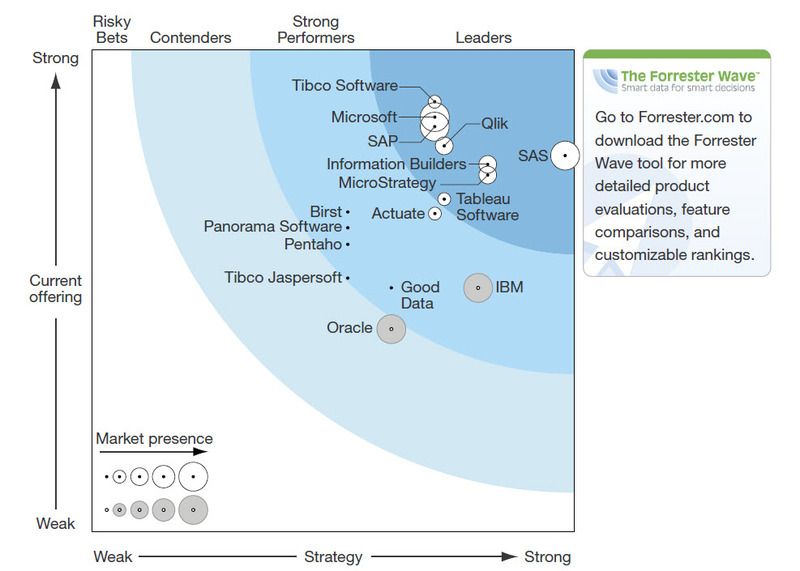 MicroStrategy Analytics Platform received top scores for the features technology professionals need to enable business user business intelligence (BI) self-service, as well as for the effectiveness of its advanced data visualization (ADV) functionality in the recently published Forrester Wave: Agile Business Intelligence Report for Q2, 2014. To get a free download of the complete report, visit MicroStrategy’s Web site at http://www.MicroStrategy.com. Today, I am adding the second post in my MicroStrategy Report Optimization series. This will be a multi-part series (I will leave it open-ended so I can continue to add to it). Today, we will look at the components that comprise performance. Source: MicroStrategy University, Deploying MicroStrategy High Performance BI, V9.3.1, MicroStrategy, Inc. September, 2013. The components above are not listed in any specific order of access during the execution of a query. The image below illustrates the five components. MicroStrategy’s memory technology is engineered to meet the increased demand for higher BI performance, which is driven by the rapid expansion of both data volumes and the number of BI users in organizations across industries. MicroStrategy accelerates performance by pre-calculating computations and placing the results into its memory acceleration engine to dramatically improve real-time query performance. Data transfer over one or more networks are a very important component of a BI implementation. A slow or poorly tuned network performance in any of those transfers will translate into poor performance from a report or a dashboard execution perspective. Successful BI applications accelerate user adoption and enhance productivity, resulting in demand for more users, data, and reports. MicroStrategy provides the ability to adapt quickly to constant changes and evolve along with business requirements. MicroStrategy Intelligence Server hs been proven in real-world scenarios to deliver the highest performance at scale with the fewest servers and minimum IT overhead. Dashboards provide graphical, executive views into KPIs, enabling quick business insights. MicroStrategy enables higher performing dashboards, averaging 30-45% faster execution and interactivity. Using new compression methods, MicroStrategy dashboards have a smaller footprint than ever before – up to to 55% smaller – resulting in faster delivery using less network bandwidth. Dashboards deliver ever more analysis and data for end-users. High performance BI starts with optimizing SQL queries to retrieve results from the database as quickly as possible. BI performance is dependent largely on the time that the queries take to execute in the database. An average reporting request usually takes 40 seconds to complete, out of which 34 seconds, or 85% of the query time, is spent executing in the database. Therefore, it is critical to optimize report queries to reduce database execution time. 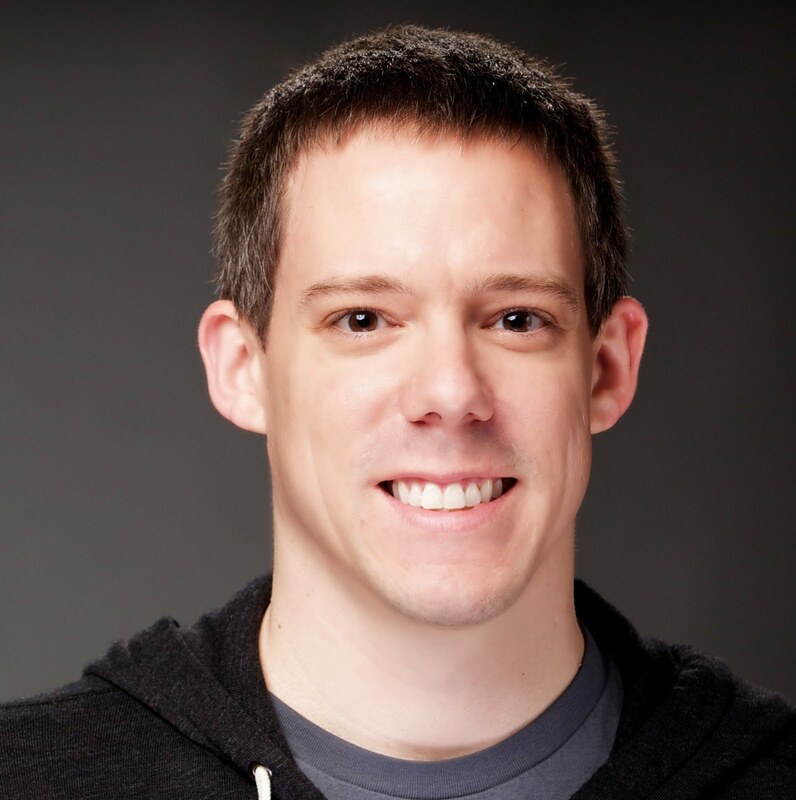 Bryan Brandow, has posted his second new post on his new blog, Bryan’s BI Blog and it is a doozy. Bryan does an in-depth comparison of MicroStrategy vs. Tableau. Here is a link to the MicroStrategy vs. Tableau post. Starting with MicroStrategy Analytics Enterprise 9.4.1, Report Services documents can contain grids with objects coming from more than one dataset. Users now have the ability to add attributes and/or metrics from multiple datasets to a single grid, graph, or widget. For example, if Dataset #1 contains Category and Revenue and Dataset #2 contains Category and Profit, a grid can be created which contains Category, Revenue, and Profit. Administrators can control the use of multiple datasets in a single grid, graph, or widget through the Analytical Engine VLDB properties window at the project level. Right mouse click (RMC) on the project name. Click “Configure” under the Analytical engine VLDB. The default value is set to: “Objects in document grids must come from the grid’s source dataset only”. The MicroStrategy Analytical Engine displays no data for metrics in ambiguous cases or when there is a conflict. Ambiguous cases can arise in cases where multiple datasets contain the same objects. Examples based on the MicroStrategy Tutorial project have been provided to explain this information. Note: When the MicroStrategy Analytical Engine cannot resolve the correct datatset as explained in the cases below, the data displayed for these will correspond to the value chosen for the missing object display under Project Configuration > Report definition > Null values > Missing Object Display. The default value for this blank. Multiple datasets have the same metric. Only one dataset does not contain this metric and this dataset is set as the source of the grid. This case is explained with an example based on the MicroStrategy Tutorial project. a. Dataset DS1 with the attribute ‘Year’ and metric ‘Profit’. b. Dataset DS2 with the attribute ‘Year’ and metrics ‘Profit’, ‘Revenue’. c. Dataset DS3 with the attribute ‘Quarter’ and metric ‘Cost’. 2. Create a document based on the above datasets and create a grid object on the document with the following objects: ‘Year’, ‘Quarter’, ‘Profit’. Set the source of this grid to be the dataset ‘DS3’. 3. 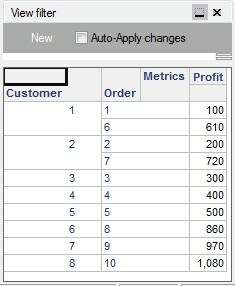 In the executed document, no data is displayed for the metric ‘Profit’ as shown below. In the above example, the metric ‘Profit’ does not exist in the source dataset ‘DS3’ and exists in more than dataset which are in the document i.e., it exists in both ‘DS1’ and ‘DS2’. Since the engine cannot just randomly pick one of the two available datasets, it chooses not to display any data for this metric. If users do not want such blank columns to be displayed, set the source dataset so that such ambiguity does not arise. The same metric exists multiple times on the grid. For example, users can have a smart compound metric and a component metric of this compound smart metric on the grid in the document. The smart metric and the component metric are from different datasets. This case is also explained with an example based on the MicroStrategy Tutorial project. a. Dataset DS1 with attribute ‘Year’ and metric ‘Profit’. b. Dataset DS2 with attribute ‘Year’ and metrics ‘Revenue’, ‘Profit’, ‘Profit Margin’ (this is a compound smart metric calculated from metrics Revenue and Profit). 2. Create a document based on the above datasets and create a grid object on the document with the following objects: ‘Year’, ‘Revenue’, ‘Profit’ and ‘Profit Margin’. The source of this grid object is set to DS1. 3. In the executed document, no data is displayed for the metric ‘Profit Margin’, as shown below. In the above example, since the source of the dataset is set to ‘DS1’, the ‘Profit’ metric is sourced from this dataset and the metric ‘Revenue’ is sourced from the dataset ‘DS2’ (as this is the ONLY datatset with this metric). However, for the metric ‘Profit Margin’, the component metric ‘Profit’ exists on dataset ‘DS1’, so this becomes a conflict metric and is not displayed. If the source of the grid is changed to ‘DS2’, the data is displayed correctly as shown below. MicroStrategy Knowledgebase, Why are some metric values blank in documents using multiple datasets in MicroStrategy Analytics Enterprise 9.4.1, TN Key: 44517, 12/16/2013, https://resource.microstrategy.com/support/mainsearch.aspx. 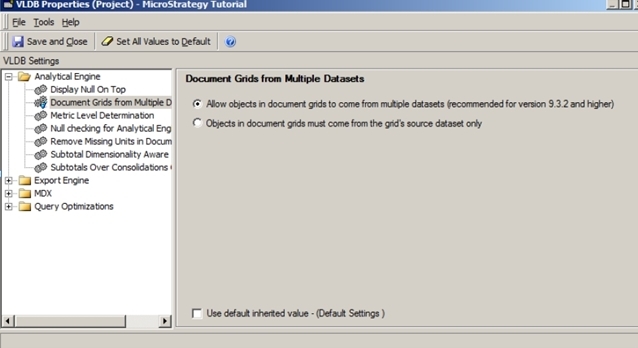 MicroStrategy Knowledgebase, Multiple datasets in a single grid/graph/widget object in MicroStrategy Web 9.4, TN Key: 44944, 09/30/2013, https://resource.microstrategy.com/support/mainsearch.aspx. NOTE: You may need to register to view MicroStrategy’s Knowledgebase. With the release of MicroStrategy Analytics Enterprise 9.4.1, the Analytical Engine logic has been enhanced with respect to joining data from multiple datasets in a Report Services Document. One of the features that is available with this release is the ability to use objects (e.g., attributes, metrics) from multiple datasets in a single grid in a document. If there is attribute form with null value, the Analytical Engine will use the non-null form value from other datasets instead of the null form. If several datasets have different attribute form information for the attribute element, the Analytical Engine will use the attribute form from the biggest dataset. If several datasets have different attribute form information for the attribute element, and those datasets have same number of rows, the Analytical Engine will use the first dataset in the document for the attribute form value (according to the dataset adding sequence). NOTE: Users should note that the rules are applied for each individual attribute element in the result at the row level rather than at the dataset level. Now users may consider a different dataset as C02 – similar to the initial dataset, but here the Customer name (DESC) form contains values instead of NULLs. 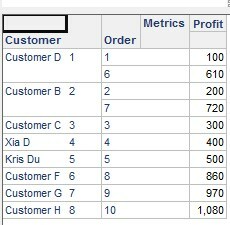 This time the values for the attributes are not consistent – see that Customer ID ‘1’ has different values for the DESC form for different Orders (1 & 6). If a report is built for this dataset users will observe that the first attribute element value in the dataset is used as as the DESC form for the Orders 1 & 6 even if the value is different in subsequent rows (this is the same as previous Analytical Engine behavior). When these datasets are used in the grid in a Report Services Document, the Analytical Engine will choose the attribute element values from dataset C02 to display in the attribute element values from. This is because of Rule 2 explained above. After replacing the dataset ‘C02‘ from the previous example with the new dataset, the following results are seen. As noted in Rule 3, because both C01 an C02 have the same number of rows, the elements displayed for the Customer attribute will be filled from from the first dataset to be added to the document – in this case C01. However for the first row in the results, where there is no corresponding customer in the dataset C01, Rule 1 will be applied and instead of a NULL value, the non-null Customer Name field ‘Customer G’ is picked from C02. (Rules are applied at the individual element level). 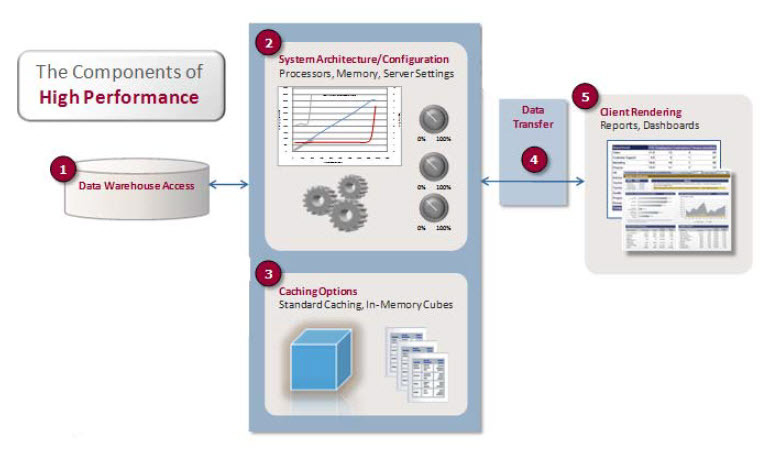 MicroStrategy Knowledgebase, Engine behavior for grids on a Report Services Document or dashboard with multiple datasets where some attribute forms are missing or have different values the datasets in MicroStrategy Analytics Enterprise 9.4.1 and newer releases, TN Key: 45463, 03/13/2014, https://resource.microstrategy.com/support/mainsearch.aspx. 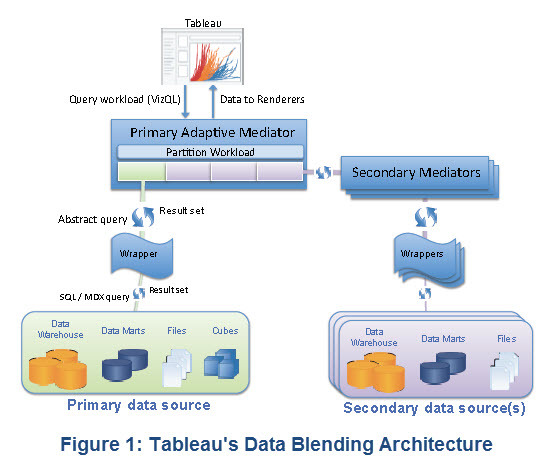 In Part 5 of this series on data blending, we reviewed Tableau’s Data Blending Architecture. With Part 5, I have wrapped up the Tableau portion of this series. I am now going to post, over the next week or so, several parts discussing how we do data blending using MicroStrategy. Fortunately, MicroStrategy just publish a nice technical note on their Knowledgebase (TN Key: 46940)  discussing this. Most of what I am sharing today is derived from that technical note. I probably will have 2-4 parts for this topic in my Data Blending series including how the MicroStrategy Analytical Engine deals with multiple datasets. I want to thank Kristi Morton (et al) for the wonderful research paper she wrote at The University of Washington . It helped me provide some real insight into the topic and mechanics of data blending, particularly with Tableau. You can learn more about Ms. Morton’s research as well as other resources used to create this blog post by referring to the References at the end of the blog post. 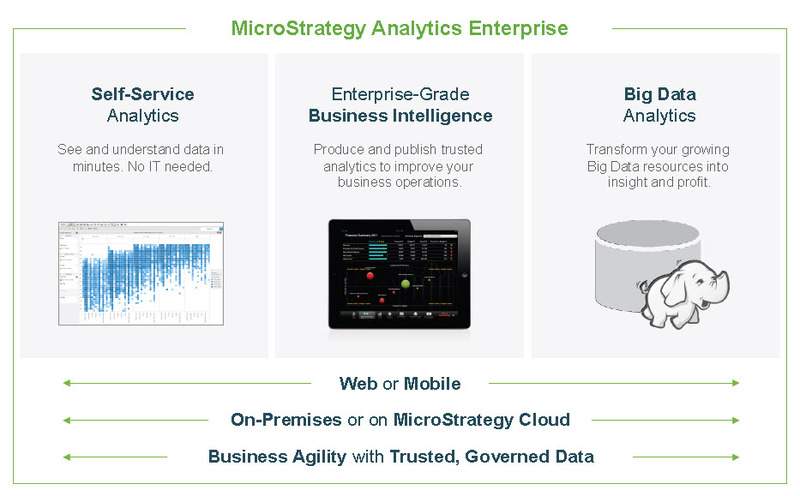 So, let’s now dig into how MicroStrategy provides us data blending capabilities. In Part 6, we will begin examining using data blending in MicroStrategy. We will first look at how to use attributes from multiple datasets in the same Visual Insight dashboard and link them to existing attributes using the Data Blend feature in MicroStrategy Analytics Enterprise Web 9.4.1. Prior to v9.4.1 of MicroStrategy, data blending was referred to as Cube Joining. In MicroStrategy Analytics Enterprise Web 9.4.1, the new Report Services Documents Engine automatically links common attributes using the modeled schema whenever possible. The manual linking is not allowed between different modeled attributes. Just in case the requirement needs to link different attributes, this can be done by using MicroStrategy Architect at the schema level. The join behavior by default for linking related attributes is done using a full outer join. In case there is no relationship between the attributes, then a cross join is used. The manual attribute linking can be done as shown in the images below. 2. Browse the file to match the existing data and select Continue. 3. Set the attribute forms if needed. MicroStrategy will automatically assign the detected ones. 4. The attributes can be mapped manually by selecting Link to Project Attribute. 6. The attribute should appear similar to the ones existing in the schema as shown below. 7. Save the recently created dataset. 8. Now there are two cubes used as datasets in the same Visual Insight dashboard, as shown below. The attributes icons now have a blue link, as shown below. This indicates that MicroStrategy has automatically linked them to elements in the Information dataset. 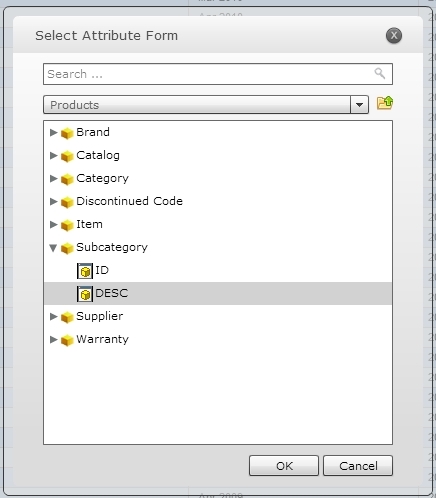 MicroStrategy Knowledgebase, How to use attributes from multiple datasets in the same Visual Insight dashboard and link them to existing attributes using the Data Blend feature in MicroStrategy Analytics Enterprise Web 9.4.1, TN Key: 46940, 04/24/2014, https://resource.microstrategy.com/support/mainsearch.aspx. NOTE: You may need to register to view MiroStrategy’s Knowledgebase. Kristi Morton, Ross Bunker, Jock Mackinlay, Robert Morton, and Chris Stolte, Dynamic Workload Driven Data Integration in Tableau, University of Washington and Tableau Software, Seattle, Washington, March 2012, http://homes.cs.washington.edu/~kmorton/modi221-mortonA.pdf. Today, in Part 5 of this series, we will peel the onion a bit more and look at Tableau’s Data Blending Architecture. Again, much of Parts 1 – 5 are based on a research paper written by Kristi Morton from The University of Washington (and others) . You can learn more about Ms. Morton’s research as well as other resources used to create this blog post by referring to the References at the end of the blog post. In Part 5, we discuss in greater detail how data blending works. Then we discuss how a user builds visualizations using data blending using several large datasets involving airline statistics. many mapping between the domain values of the primary key and those of the secondary join key, because the secondary join key is a subset of the primary key and contains only unique values in the aggregated secondary result set. Morton (et al) find that this approach is the most natural for augmenting a visualization with secondary data sources of uncertain value or quality, which is a common scenario for Tableau users. Data blending supports many-to-one relationships between the primary and each secondary. This can occur when the secondary data source contains coarser-grained data than the mediated result set, as discussed in Part 3 of this series. Since the join key in a secondary result set may match a subset of the blended result set primary key, portions of the secondary result set may be duplicated across repeated values in the mediated result set. This does not pose risk of double-counting measure values, becaused all aggregation is performed prior to the join. When a blended visualization uses multiple secondary data sources, each secondary join key may match any subset of the primary key. The primary mediator handles duplicating each secondary result set as needed to join with the mediated result set. when used in calculated fields or other computations. The visual feedback allows a user to distinguish this lack of data from the NULLs which occur due to missing or mismatched data. The secondary data source field name must match a field with the same name in the primary data source. If they are date/time fields, they must represent the same granularity date bin in the date/time hierarchy, e.g. both are MONTH. 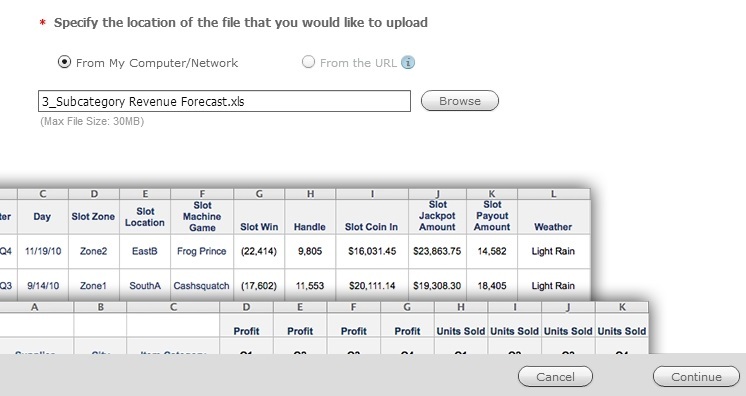 A user can intervene to force a match either by providing field captions to rename fields within the Tableau data model, or by explicitly defining a link between fields using a simple user interface. 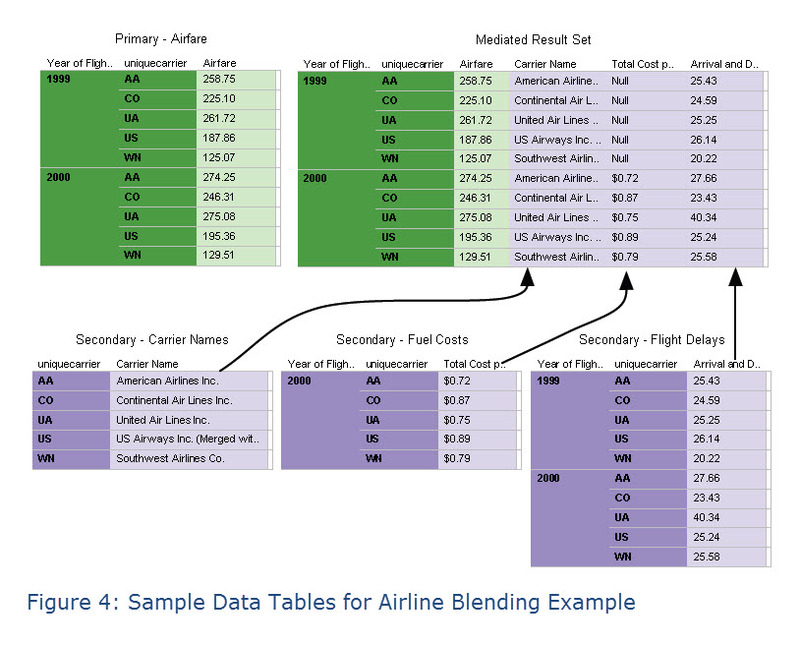 A Tableau data blending scenario is shown in Figure 3 above, which includes multiple views that were composed in minutes by uniquely mashing up four different airline datasets, the largest of which include a 324 million row ticket pricing database and a 140 million row on-time performance database. A user starts by dragging fields from any dataset on to a blank visual canvas, iteratively building a VizQL statement which ultimately produces a visualization. In this example, the user first drags the VizQL fields, YEAR(Flight Date) and AVG(Airfare), from the pricing dataset onto the visual canvas. Data blending occurs when the user adds fields from a separate dataset to an existing VizQL statement in order to augment their analysis. Tableau assigns the existing dataset to the primary mediator and uses secondary mediators to manage each subsequent dataset added to the VizQL. The mediated schema has a primary key composed of the grouping VizQL fields from the primary dataset (e.g. YEAR(Flight Date)); the remaining fields in the mediated schema are the aggregated VizQL fields from the primary dataset along with the VizQL fields from each secondary dataset. the secondary dataset for one or more fields whose name exactly matches a field in the primary key of the mediated schema. While the proposed matches are often sufficient and acceptable, the user can specify an override. Since the fuel cost dataset has a field named Date, the user provides a caption of Flight Date to resolve the schema discrepancy. At this point the mediated schema is created and the VizQL workload is then federated to the wrappers for each dataset. Each wrapper compiles VizQL to SQL or MDX for the given workload, executes the query, and maps the result set into the intermediate form expected by the primary mediator. 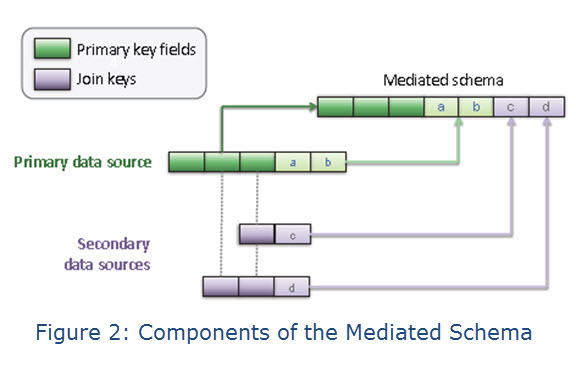 performs a left-join of each secondary result set along the primary key of the mediated schema. In this example, the mediated result set is rendered to produce the visualization shown in Figure 3(a). 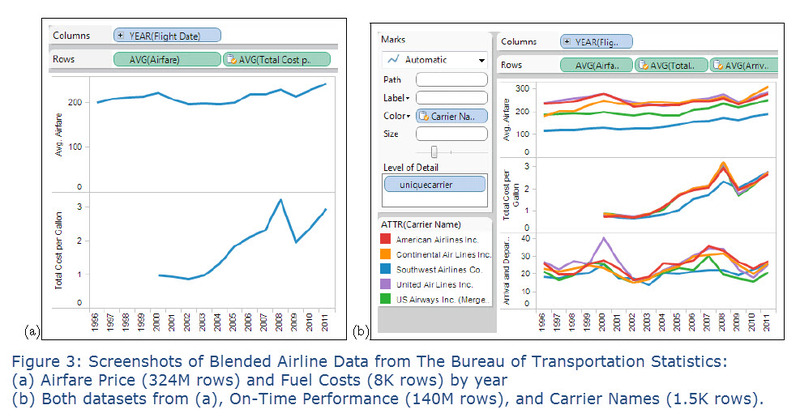 Figure 3(b) above shows further evolution of the analysis of airline datasets, and demonstrates several key points of data blending. First, the user adds a unique ID field named unique carrier from the primary dataset to the VizQL to visualize results for each airline ID over time. The mediated schema adapts by adding this field to its primary key, and the secondary mediator automatically queries the fuel cost dataset at this finer granularity since it too has a field named uniquecarrier. Next, the user decorates the visualization with descriptive airline names for each airline ID by dragging a field named Carrier Name from a lookup table. This dataset is at a coarser granularity than the existing mediated schema, since it does not represent changes to the carrier name over time. Morton’s (et al) system automatically handles this challenge by allowing the left-join to use a subset of the mediated result set primary key, and replicating the carrier name across the mediated result set. Figure 4 below demonstrates this effect using a tabular view of a portion of the mediated result set, along with portions of the primary and secondary result sets. The figure also demonstrates how the left-join preserves data for years which have no fuel cost records. Last, the user adds average airline delays from a 140 million row dataset which matches on Flight Date and uniquecarrier. This is a fast operation, since the wrapper performs mapping operations on the relatively small, aggregated result set produced by the remote database. Note that none of these additional analytical tasks required the user to intervene in data integration tasks, allowing their focus to remain on finding insight in the data. 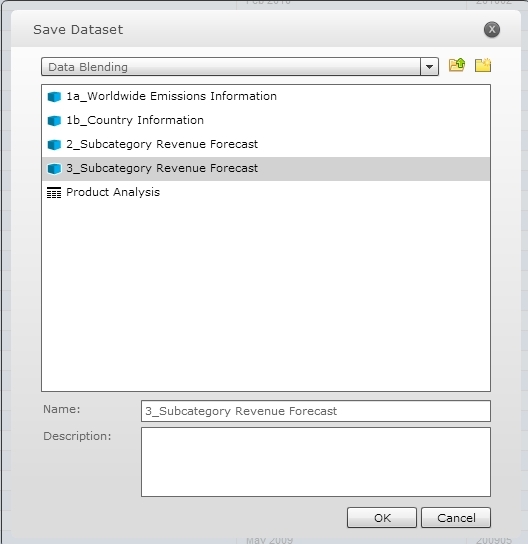 Tableau provides several options for filtering data. Data may be filtered based on aggregate conditions, such as excluding including airlines having a low total count of flights. A user can filter aggregate data from the primary and secondary data sources in this fashion, which results in rows being removed from the mediated result set. In contrast, row level filters are only allowed for the primary data source. To improve performance of queries sent to the secondary data sources, Tableau will filter the join keys to exclude values which are not present in the domain of the primary data source result set, since these values would be discarded by the left-join. As mentioned in the Inferring Join Keys section above, Tableau supports user intervention in resolving field names when schema matching fails. And once the schemas match and data is blended, the visualization can help provide feedback regarding the validity of the underlying data values and domains. If there are any data inconsistencies, users can provide aliases for a field’s data values which will override the original values in any query results involving that field. The primary mediator performs a left-join using the aliases of the data values, allowing users to blend data despite discrepancies from data entry errors and spelling variations. Tableau provides a simple user interface for editing field aliases. 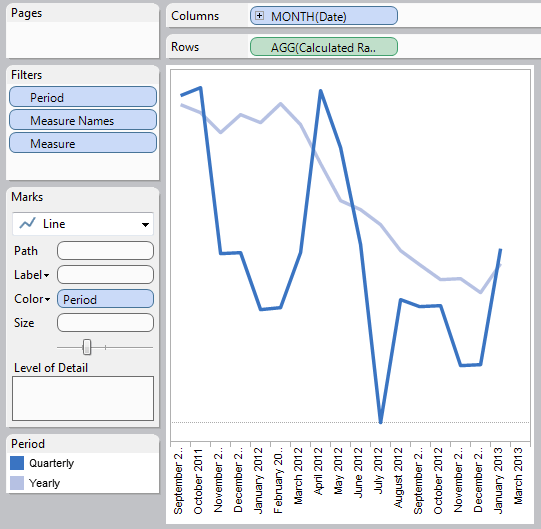 Calculated fields are another aspect of Tableau’s data model which support data cleaning. Calculated fields support arbitrary transformations of original data values into new data values, such as trimming whitespace from a string or constructing a date from an epoch-based integer timestamp. As with database fields, calculated fields can be used as primary keys or join keys. Finally, Tableau allows users to organize a field’s related data values into groups. These ad-hoc groups can be used for entity resolution, such as binding multiple variations of business names to a canonical form. Ad-hoc groups also allow constructing coarser-grained structures, such as grouping states into regions. Data blending supports joins between two ad-hoc groups, as well as joins between an ad-hoc group and a string field. Hans Rosling, Wealth & Health of Nations, Gapminder.org, http://www.gapminder.org/world/. Jonathan Drummey, Tableau Data Blending, Sparse Data, Multiple Levels of Granularity, and Improvements in Version 8, Drawing with Numbers, March 11, 2013, http://drawingwithnumbers.artisart.org/tableau-data-blending-sparse-data-multiple-levels-of-granularity-and-improvements-in-version-8/. 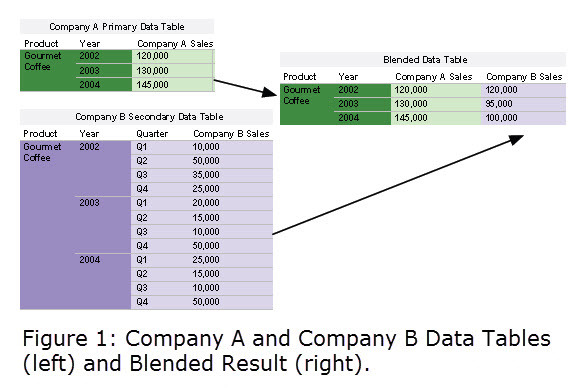 In Part 3 of this series on data blending, we examining the benefits of blending data. 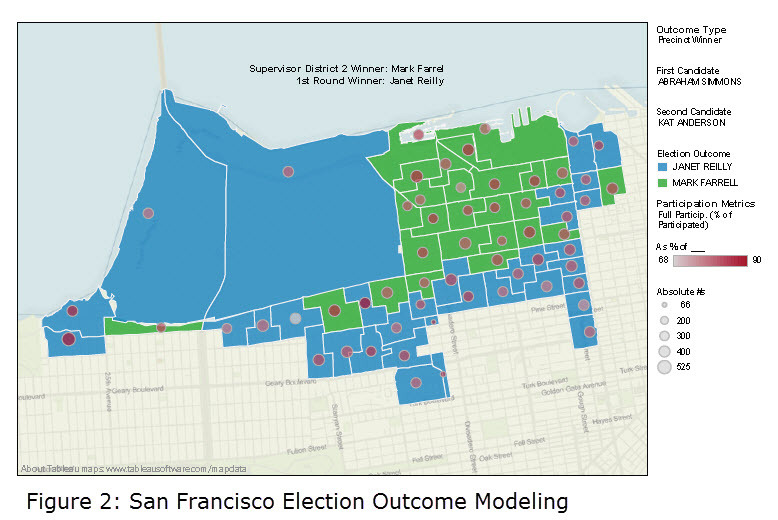 We also reviewed an example of data blending that illustrated the possible outcomes of an election for the District 2 Supervisor of San Francisco. Today, in Part 4 of this series, we will discuss data blending design principles and show another illustrative example of data blending using Tableau. Again, much of Parts 1, 2, 3 and 4 are based on a research paper written by Kristi Morton from The University of Washington (and others) . In Part 3, we describe the primary design principles upon which Tableau’s data blending feature was based. These principles were influenced by the application needs of Tableau’s end-user. In particular, we designed the blending system to be able to integrate datasets on-the-fly, be responsive to change, and driven by the visualization. Additionally, we assumed that the user may not know exactly what she is looking for initially, and needs a flexible, interactive system that can handle exploratory visual analysis. Tableau’s approach to data visualization allows users to leverage the power of a fast database system. Tableau’s VizQL algebra is a declarative language for succinctly describing visual representations of data and analytics operations on the data. Tableau compiles the VizQL declarative formalism representing a visual specification into SQL or MDX and pushes this computation close to the data, where the fast database system handles computationally intensive aggregation and filtering operations. In response, the database provides a relatively small result set for Tableau to render. This is an important factor in Tableau’s choice of post-aggregate data integration across disparate data sources – since the integrated result sets must represent a cognitively manageable amount of information, the data integration process operates on small amounts of aggregated, filtered data from each data source. This approach avoids the costly migration effort to collocate massive data sets in a single warehouse, and continues to leverage fast databases for performing expensive queries close to the data. Tableau’s primary focus has been on ease of use since most of Tableau’s end-users are not database experts, but range from a variety of domains and disciplines: business analysts, journalists, scientists, students, etc. This lead them to take a simple, pay-as-you-go integration approach in which the user invests minimal upfront effort or time to receive the benefits of the system. For example, the data blending system does not require the user to specify schemas for their data sets, rather the system tries to infer this information as well as how to apply schema matching techniques to blend them for a given visualization. Furthermore, the system provides a simple drag-and-drop interface for the user to specify the fields for a visualization, and if there are fields from multiple data sources in play at the same time, the blending system infers how to join them to satisfy the needs of the visualization. In the case that something goes wrong, for example, if the schema matching could not succeed, the blending system provides a simple interface for specifying data source relationships and how blending should proceed. Additionally, the system provides several techniques for managing the impact of dirty data on blending, which we discuss in more in Part 5 of this series. NOTE: The following example is from Jonathan Drummey via the Drawing with Numbers blog site. 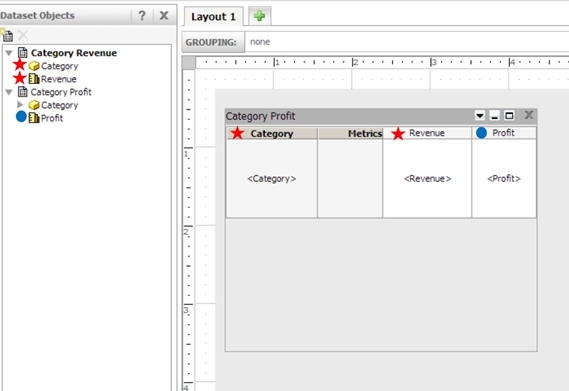 The example uses Tableau v7, but at the end of the instructions on how he creates this dashboard in Tableau v7, Mr. Drummey includes instructions how the steps became more simplied in Tableau v8. I have included a reference to this blog post on his site in the reference section of my blog entry. The “I”, “me” voice you read in this example is that of Mr. Drummey. As part of improving patient safety, we track all patient falls in our healthcare system, and the number of patient days – the total of the number of days of inpatient stays at the hospital. Every month report we report to the state our “fall rate,” a metric of the number of falls with injury for certain units in the hospital per 1000 patient days, i.e. days that patients are at the hospital. Our annualized target is to have less than 0.7 falls with injury per 1000 patient days. Sparse Data – As I’m writing this, it’s March 7th. We usually don’t get the denominator of the patient days for the prior month (February) for a few more days yet, so there won’t be any February row of measure data to use as the primary to get the February fall events to show on the dashboard. In addition, there still wouldn’t be any March data to get the March fall events. Sometimes when working with blend, the solution is to flip our choices for the primary and secondary datasource. However, that doesn’t work either because a unit might go for months or years without a patient fall, so there wouldn’t be any fall events to blend in the measure data. Falls With and Without Injury – In the bar chart, we don’t just want to show the number of patient falls, we want to break down the falls by whether or not they were falls with injury – the numerator for the fall rate metric – and all other falls. The goal of displaying that data is to help the user keep in mind that as important as it is to reduce the number of falls with injury, we also need to keep the overall number of falls down as well. No fall = no chance of fall with injury. Unit Level of Detail – Because the blend needs to work at the per-unit level of detail as well as across all reporting units, that means (in version 7 at least) that the Unit needs to be in the view for the blend to work. But we want to display a single falls rate no matter how many units are selected. Change the combined line and bar chart into separate charts. This would perhaps be the easiest, though it would require some messing about with filters, hidden reference lines, and continuous date axes to ensure that the two charts had similar axis ranges no matter what. However, that would miss out on the key capability of the combined chart to directly see how a fall contributes to the fall rate. In addition, there would be no reason to write this blog post. Perform padding in the data source, either via a query/view or Custom SQL. In an earlier version of this project I’d built this, and maintaining a bunch of queries with Cartesian joins isn’t my favorite cup of tea. Building a scaffold data source with all combinations of the month and unit and using the scaffold as the primary data source. While possible, this introduces maintenance issues when there’s a need for additional fields at a finer level of detail. For example, the falls measure actually has three separate fall rates – monthly, quarterly, and annual. These are generated as separate rows in our measures data and the particular duration is indicated by the Period field. So the scaffold source would have to include the Period field to get the data, but then that could be too much detail for the blended fall event data, and make for more complexity in the calculations to make sure the aggregations worked properly. In my case, the primary data source is a Microsoft Access query that gets the falls measure results from a table that also holds results for hundreds of other metrics that we track. I created a second query with the same number of columns that returns Null for every field except the Measure Date, which has a value of 1/1/1900. 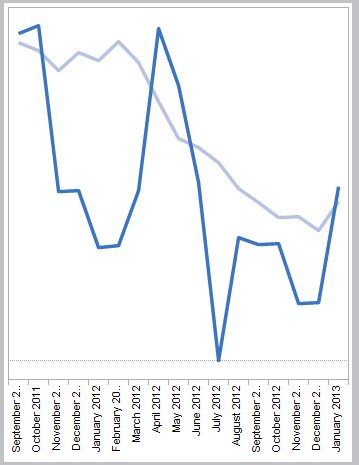 Then a third query UNION’s those two queries together, and that’s what is used as the data source in Tableau. With a continuous (green pill) date, this particular set-up won’t work in version 8. Tableau’s domain padding is not triggered when the last value of the measure is Null. I’m hoping this is just an issue with the beta, I’ll revise this section with an update once I find out what’s going on. Even though the measure data only has end of month dates, instead of using Exact Date for the month I used Month(Date) because of two combined factors: One is that the default import of most date fields from MS Jet sources turns them into DateTime fields, the second is that Show Missing Values won’t work on an Exact Date for a DateTime field, you have to assign an aggregation to a DateTime (even Second will work). This is because domain padding at this level can create an immense number of new rows and cause Tableau to run out of memory, so Tableau keeps the option off unless you want it. Also note that you can turn on Show Missing Values for an Exact Date for a Date Field. Now for some cleanup steps: for the purposes of this dashboard, filter Period to remove Monthly (we do quarterly reporting), but leave in Null because that’s needed for the domain padding. Right-click Null on the Color Legend and Hide it. Again, we don’t exclude this because this would cause the extra row for the domain padding to fail. Set up a relative date filter on the Date field for the last 13 months. This filter works just fine with the domain padding. We’re using a row-level calculated field to generate the measure, and a slightly different calc for Falls w/out Injury. Don’t use blending at all, instead use a query to perform the “blend” outside of Tableau. In the case that there are totally different data sources, this can be more difficult but not impossible by using one of the systems or a different system to create a federated data source, for example by adding your Oracle table as an ODBC connection to your Excel data, then making the query on that. In this case, we don’t have to do that. 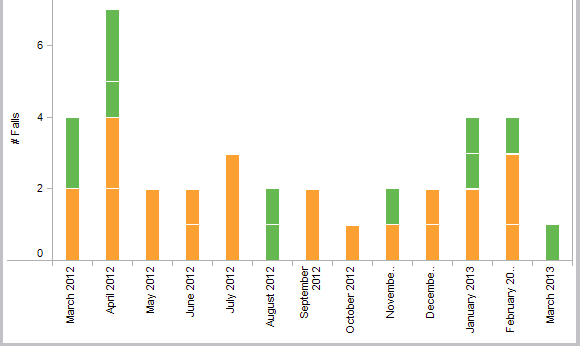 Use Tableau’s Primary Groups feature “push” the detail from the secondary into the primary data source. This is a really helpful feature, the one drawback is that it’s not dynamic so any time there are new groupings in the secondary it would have to be re-run. Personally, I prefer automating as much as possible so I tend not to use this technique. Set up the view with the needed dimensions in the view – on the Level of Detail Shelf, for example – and then use table calculations to do the aggregation. This is how I’ve typically built this kind of view. 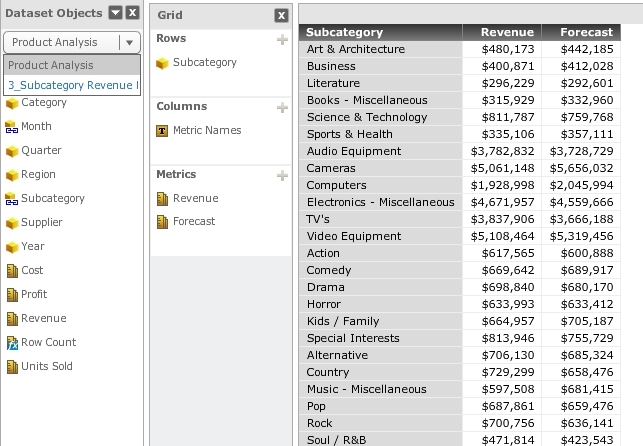 Tell Tableau what fields to blend on, then bring in your measures from the secondary. I’ll walk through the table calculation technique, which works the same in version 7 and version 8, and then how to take advantage of v8′s new feature. In order to blend the the falls data at the hospital unit level to make sure that we’re only showing falls for the selected unit(s), the Unit has to be in the view (on the Rows, Columns, or Pages Shelves, or on the Marks Card). Since we don’t actually need to display the Unit, the Level of Detail Shelf is where we’ll put that dimension. However, just adding that to the view leads to a bar for each unit, for example for April 2012 one unit had one fall with injury and another had two, and two units each had two falls without injury. The ,0 IIF(FIRST()==0,LAST(),0 part is necessary in version 7 to optimize performance, you can get rid of that in version 8. You can also do a table calculation in the primary that accesses fields in the secondary, however TOTAL() can’t be used across blended data sources, so you’d have to use the WINDOW_SUM version. Add Measure Names (from the Primary) to Filters Shelf, filter it for a couple of random measures. Put Measure Values on the Rows Shelf. Click on the Measure Values pill on Rows to set the Mark Type to Bar. Drag Measure Names onto the Color Shelf (for the Measure Values marks). Drag Unit onto the Level of Detail Shelf (for the Measure Values marks). Switch to the Secondary to put the two Falls for v7 Blend calcs onto the Measure Values Shelf. Set their Compute Usings to Unit. Remove the 2 measures chosen in step 1. Clean up the view – turn on dual axes, move the secondary axis marks to the back, change the axis tick marks to integers, set axis titles, etc. Switch to the Secondary and click the chain link icon next to Unit to turn on blending on Unit. Drag the Falls w/Injury and Falls w/out Injury calcs onto the Measure Values Shelf. The results will be the same as v7. In Part 2 of this series on data blending, we delved deeper into understanding what data blending is. We also examined how data blending is used in Hans Rosling’s well-known Gapminder application. Today, in Part 3 of this series, we will dig even deeper by examining the benefits of blending data. Again, much of Parts 1, 2 and 3 are based on a research paper written by Kristi Morton from The University of Washington (and others) . In this section, we will examine the advantages of using the data blending feature for integrating datasets. 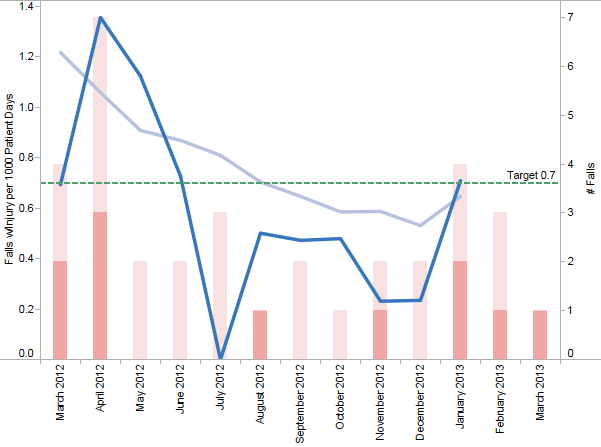 Additionally, we will review another illustrative example of data blending using Tableau. Often times a user wants to combine data that may not be at the same granularity (i.e. they have different primary keys). For example, let’s say that an employee at company A wants to compare the yearly growth of sales to a competitor company B. The dataset for company B (see Figure 1 above) contains a detailed quarterly growth of sales for B (quarter, year is the primary key), while company A’s dataset only includes the yearly sales (year is the primary key). If the employee simply joins these two datasets on yearly earnings, then each row from A will be duplicated for each quarter in B for a given year resulting in an inaccurate overestimate of A’s yearly earnings. This duplication problem can be avoided if for example, company B’s sales dataset were first aggregated to the level of year, then joined with company A’s dataset. In this case, data blending detects that the data sets are at different granularities by examining their primary keys and notes that in order to join them, the common field is year. In order to join them on year, an aggregation query is issued to company B’s dataset, which returns the sales aggregated up to the yearly level as shown in Figure 1. This result is blended with company A’s dataset to produce the desired visualization of yearly sales for companies A and B. The blending feature does all of this on-the-fly without user-intervention. As mentioned in Part 1, managed repository is expensive and untenable. In other cases, the data repository may have rigid structure, as with cubes, to ensure performance, support security or protect data quality. Furthermore, it is often unclear if it is worth the effort of integrating an external data set that has uncertain value. The user may not know until she has started exploring the data if it has enough value to justify spending the time to integrate and load it into her repository. Thus, one of the paramount benefits of data blending is that it allows the user to quickly start exploring their data, and as they explore the integration happens automatically as a natural part of the analysis cycle. An interesting final benefit of the blending approach is that it enables users to seamlessly integrate across different types of data (which usually exist in separate repositories) such as relational, cubes, text files, spreadsheets, etc. A key benefit of data blending is its flexibility; it gives the user the freedom to view their blended data at different granularities and control how data is integrated on-the-fly. The blended views are dynamically created as the user is visually exploring the datasets. For example, the user can drill-down, roll-up, pivot, or filter any blended view as needed during her exploratory analysis. This feature is useful for data exploration and what-if analysis. Figure 2 (below) illustrates the possible outcomes of an election for District 2 Supervisor of San Francisco. With this type of visualization, the user can select different election styles and see how their choice affects the outcome of the election. What’s interesting from a blending standpoint is that this is an example of a many-to-one relationship between the primary and secondary datasets. This means that the fields being left-joined in by the secondary data sources match multiple rows from the primary dataset and results in these values being duplicated. Thus any subsequent aggregation operations would reflect this duplicate data, resulting in overestimates. The blending feature, however, prevents this scenario from occurring by performing all aggregation prior to duplicating data during the left-join. Today I am beginning a multi-part series on data blending. Parts 1, 2 and 3 will be an introduction and overview of what data blending is. Part 4 will review an illustrative example of how to do data blending in Tableau. Part 5 will review an illustrative example of how to do data blending in MicroStrategy. I may also include a Part 6, but I have to see how my research on this topic continues to progress over the next week. Much of Parts 1, 2 and 3 are based on a research paper written by Kristi Morton from The University of Washington (and others) . Please review the source references, at the end of each blog post in this series, to be directed to the source material for additional information. I hope you find this series helpful for your data visualization needs. Using a Web-based visual interface to data and a focus on usability, these tools enable a wide audience of business partners (IT’s end-users) to gain insight into their datasets. The user experience is a fluid process of interaction in which exploring and visualizing data takes just a few simple drag-and-drop operations (no programming skills or DB experience is required). 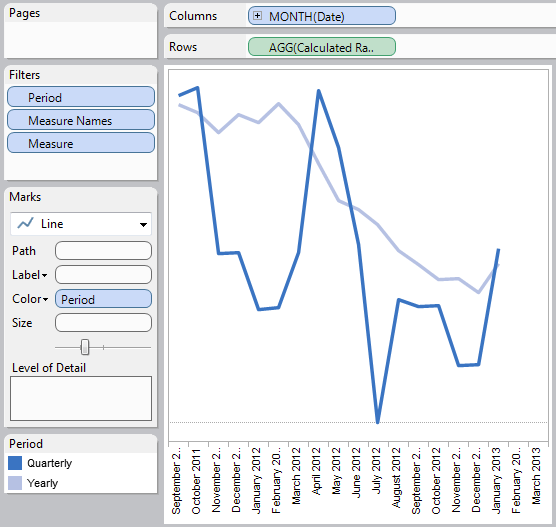 In this context of exploratory, ad-hoc visual analysis, we will explore a feature originally introduced in Tableau in 2006, and in MicroStrategy’s new Analytics Platform v9.4.1 late last year (2013). We will examine how we can integrate large, heterogeneous data sources. This feature is called data blending, which gives users the ability to create data visualization mashups from structured, heterogeneous data sources dynamically without any upfront integration effort. Users can author visualizations that automatically integrate data from a variety of sources, including data warehouses, data marts, text files, spreadsheets, and data cubes. Because data blending is workload driven, we are able to bypass many of the pain points and uncertainty in creating mediated schemas and schema-mappings in current pay-as-you-go integration systems. Unlike databases, our human brains have limited capacity for managing and making sense of large collections of data. In database terms, the feat of gaining insight in big data is often accomplished by issuing aggregation and filter queries (producing subsets of data). However, this approach can be time-consuming. The user is forced to complete the following tasks. Figure out what queries to write. Read through these textual summaries (often containing thousands of rows) to search for interesting patterns or anomalies. Tools like Tableau and MicroStrategy help bridge this gap by providing a visual interface to the data. This approach removes the burden of having to write queries. The user can ask their questions through visual drag-and-drop operations (again, no queries or programming experience required). Additionally, answers are displayed visually, where patterns and outliers can quickly be identified. Visualizations leverage the powerful human visual system to help us effectively digest large amounts of information and disseminate it quicker. Figure 1, above, illustrates how visualization is a key component in turning information into knowledge and knowledge into wisdom. The process starts with some task or question that a knowledge worker (shown at the center) seeks to gain understanding. In the first stage, the user forages for data that may contain relevant information for their analysis task. Next, they search for a visual structure that is appropriate for the data and instantiate that structure. At this point, the user interacts with the resulting visualization (e.g. drill down to details or roll up to summarize) to develop further insight. Once the necessary insight is obtained, the user can then make an informed decision and take action. This cycle is centered around and driven by the user and requires that the visualization system be flexible enough to support user feedback and allow alternative paths based on the needs of the user’s exploratory tasks. 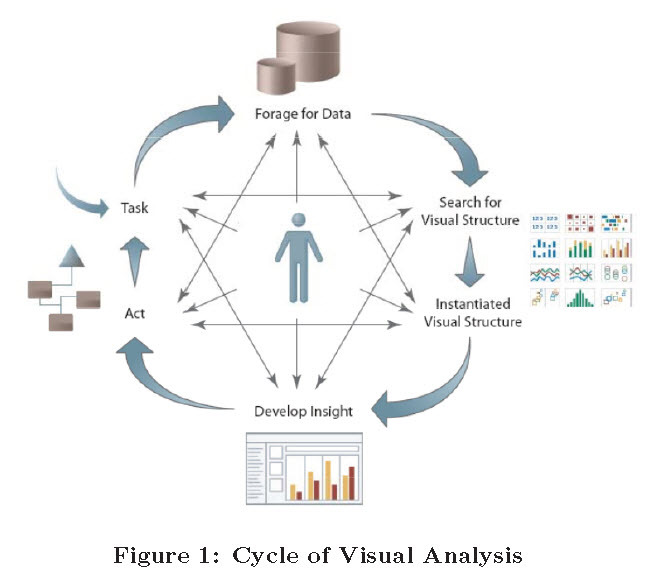 Most visualization tools, however, treat this cycle as a single, directed pipeline, and offer limited interaction with the user. Moreover, users often want to ask their analytical questions over multiple data sources. However, the task of setting up data for integration is orthogonal to the analysis task at hand, requiring a context switch that interrupts the natural flow of the analysis cycle. We extend the visual analysis cycle with a new feature called data blending that allows the user to seamlessly combine and visualize data from multiple different data sources on-the-fly. Our blending system issues live queries to each data source to extract the minimum information necessary to accomplish the visual analysis task. Often, the visual level of detail is at a coarser level than the data sets. Aggregation queries, therefore, are issued to each data source before the results are copied over and joined in Tableau’s local in-memory view. We refer to this type of join as a post-aggregate join and find it a natural fit for exploratory analysis, as less data is moved from the sources for each analytical task, resulting in a more responsive system. Finally, Tableau’s data blending feature automatically infers how to integrate the datasets on-the-fly, involving the user only in resolving conflicts. This system also addresses a few other key data integration challenges, including combining datasets with mismatched domains or different levels of detail and dirty or missing data values. One interesting property of blending data in the context of a visualization is that the user can immediately observe any anomalies or problems through the resulting visualization. These aforementioned design decisions were grounded in the needs of Tableau’s typical BI user base. Thanks to the availability of a wide-variety of rich public datasets from sites like data.gov, many f Tableau’s users integrate data from external sources such as the Web or corporate data such as internally-curated Excel spreadsheets into their enterprise data warehouses to do predictive, what-if analysis. However, the task of integrating external data sources into their enterprise systems is complicated. First, such repositories are under strict management by IT departments, and often IT does not have the bandwidth to incorporate and maintain each additional data source. Second, users often have restricted permissions and cannot add external data sources themselves. Such users cannot integrate their external and enterprise sources without having them collocated. An alternative approach is to move the data sets to a data repository that the user has access to, but moving large data is expensive and often untenable. We therefore architected data blending with the following principles in mind: 1) move as little data as possible, 2) push the computations to the data, and 3) automate the integration challenges as much as possible, involving the user only in resolving conflicts.